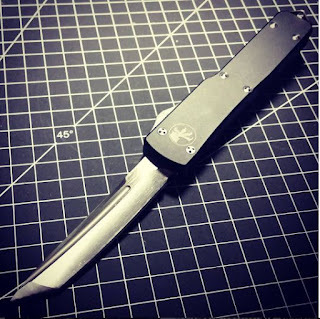 Best Chinese Knives: Microtech Ultratech Style Tanto Clone with Aluminium Handle Review - Great entry level OTF knife! 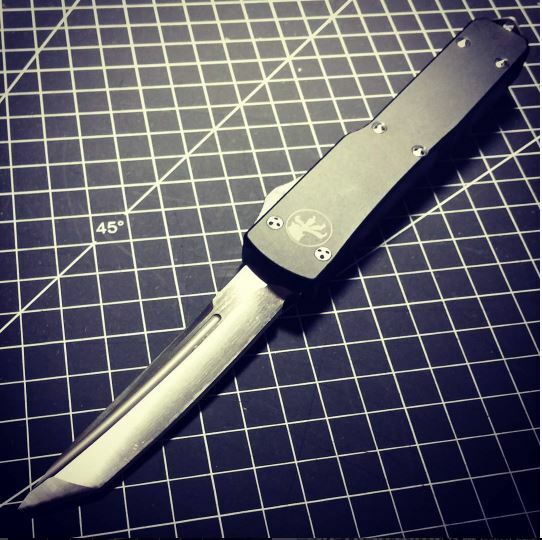 Microtech Ultratech Style Tanto Clone with Aluminium Handle Review - Great entry level OTF knife! Just received my Ultratech Clone from Common Lancehead Knives. First impressions are great - the knife came very well packed in a Microtech Style box with a nylon sheath and a cloth. Out of the box it is sharp, the mechanics work fine, no initial screw ups, has little bladeplay (which is ok for this type of knife). - Fit and finish are excellent, on par with original knives from Microtech. - Mechanics are awesome (got better from the initial after I put some oil inside). - It came sharp with even grind and bevels. - Bladeplay got even smaller with time. - Very good pocket clip. - The knife came dry, it is very important to put oil inside to protect the spring. - It is a little bit thick behind the edge. - The knife came with some stains on the blade, which were gone after cleaning with WD40. - Screws need to be put on Locktite. *All the cons are just me being picky. Overall the knife is awesome, I am very pleased with it. It is made better and performs better than any other entry level OTF knife, especially considering the price. Knife can be found here: Ultratech Style.